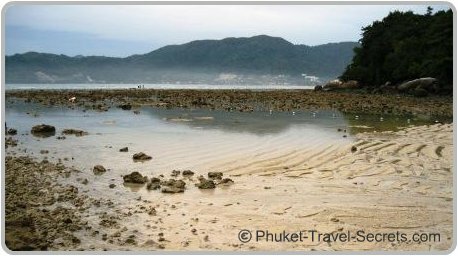 This north facing 500 metre long picturesque beach is also known to many as "Emerald Beach" or "Hat Tri Tra", which overlooks Patong Bay. The beachfront is lined with casaurina trees and fine sand. The three other beaches in this headland are Paradise Beach, Tri Trang Beach and Freedom Beach. For some reason this beach also gets called Tri Trang Beach, maybe because the Tri Trang Beach Resort is located at one end of the beach. If your looking for Tri Trang Beach it is located further along in the headland in a nice quiet bay in front of the four star Merlin Beach Resort. 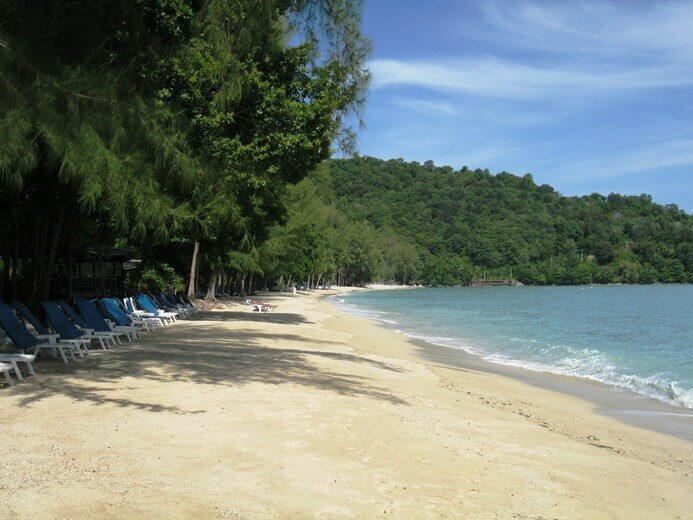 Tri Tra Beach is a place where you can come to truly relax and unwind away from the crowds of Patong. The bay offers calm clean waters and is a great spot to spoil yourself for a day or to enjoy a week long vacation. 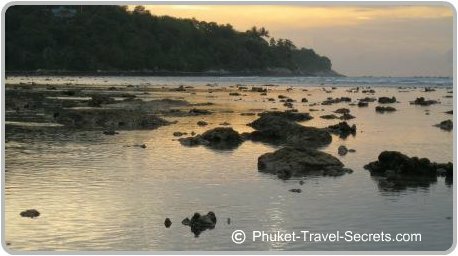 During one of our many visits to Phuket we enjoyed four relaxing days at Tri Tra Beach, and can highly recommend the location for a relaxing getaway. 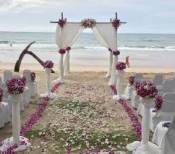 We stayed at the Tri Trang Beach Resort and found the facilities on the beachfront to be good. Towards the other end of Tri Tra Beach is where guests that stay at the nearby Merlin Beach Resort prefer to spend their days basking in the sun. At this end of the beach there was a massage hut as well as the Windsurf Restaurant, unfortunately during a recent visit we found that both had been demolished. Tri Tra is certainly not the best for swimming as it is very rocky underfoot. However on high tide you can still swim and go snorkeling and is safe all year round, with areas sectioned off with buoys so that boats and jet ski's stay away from the swimming area's. We found the best area for swimming was directly in front of the Tri Trang Resort. If you are going to explore Tri Tra Beach just for a few hours, the best time to go is on high tide, and ensure to wear a pair of reef shoes in the water. In the middle of the beach you can hire snorkeling gear and kayaks to go exploring around the bay. As you can see in the pictures the only downside to this beach is that it is quite rocky with several small corals and it is too shallow on low tide to go for a swim. There is a restaurant located at Tri Trang Resort that has a selection of Thai, seafood and western food and is open daily until 10.00 pm. With the opening of the new Rosewood Resort you can now enjoy delicious meals at the Ta Khai Restaurant. One of our favorite restaurants was the Windsurf Restaurant which was located at the far end of the beach closer to the Merlin Beach Resort, but unfortunately it was demolished in 2014. If your looking to unwind and stay a couple of nights around Tri Tra beach you will be pleasantly surprised. 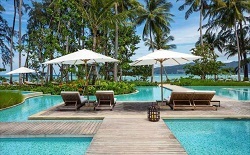 The Rosewood Phuket is a five star luxury hideaway. 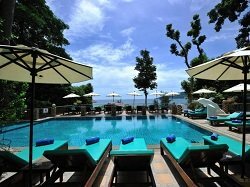 Tri Trang Beach Resort provides guests a relaxing holiday in Phuket. Please note that there are many stairs at this resort. 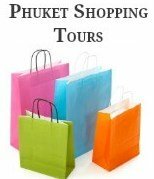 Due to the location the hotel provides a shuttle into Patong which is free up until 3pm. Use the search box below to view other resorts near Tri Tra & Tri Trang. 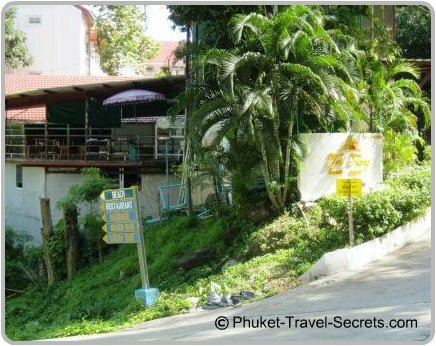 At the far south end of Patong, drive across the Patong River Bridge and follow the Muan-Ngern Road for around 3 kilometres. On the way you will pass the Amari Coral Beach Resort, Baan Yin Dee Resort and continue until you reach the turn off to the Tri Trang Resort. Follow this road to the car park located near the beachfront. 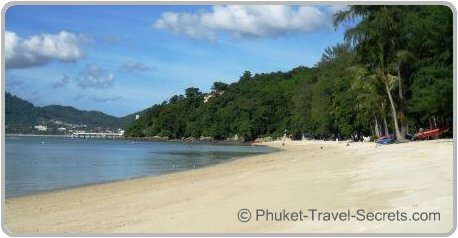 Whatever the beach is called whether it be Emerald Beach, Tri Tra Beach or Tri Trang Beach or even Crystal beach we would have to rate it as one of the most relaxing, laidback beaches in Phuket.